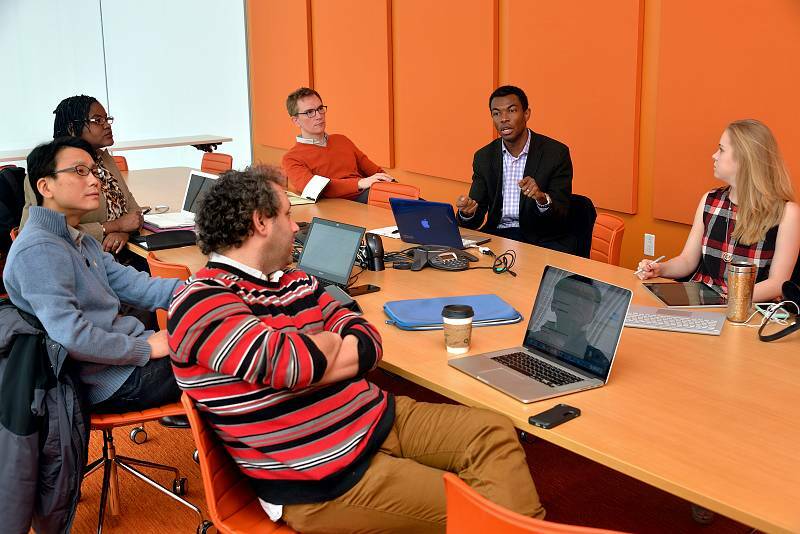 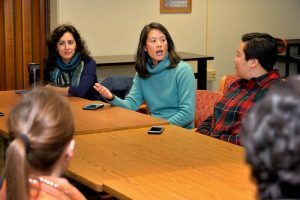 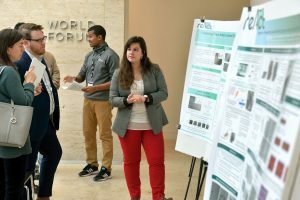 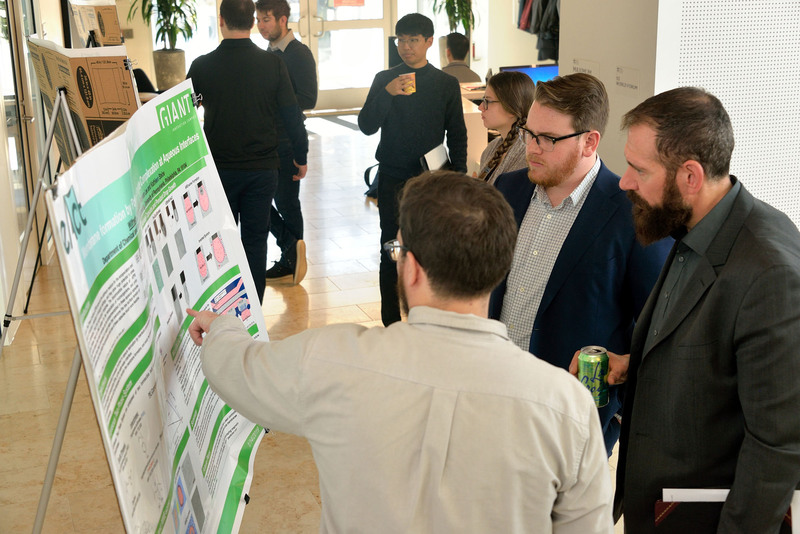 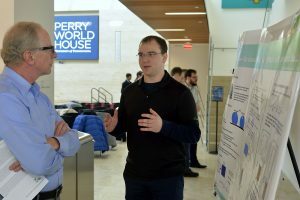 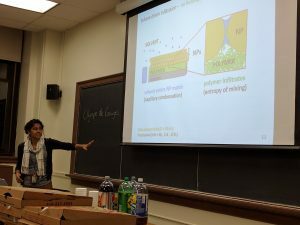 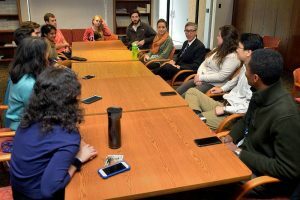 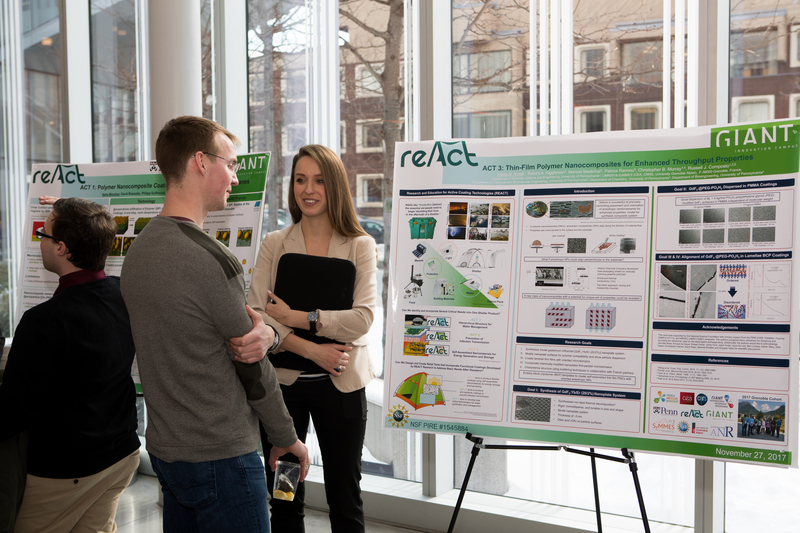 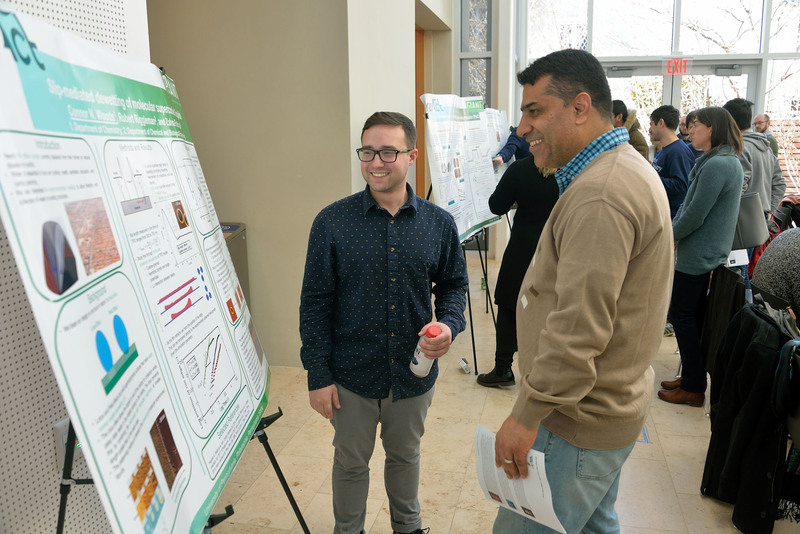 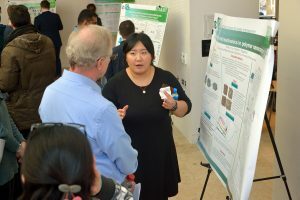 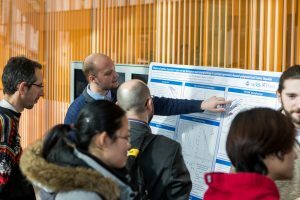 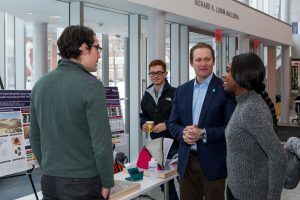 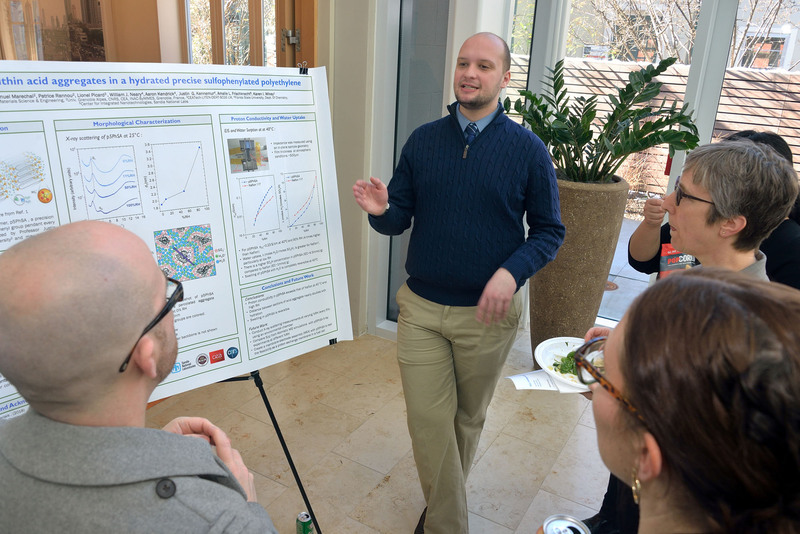 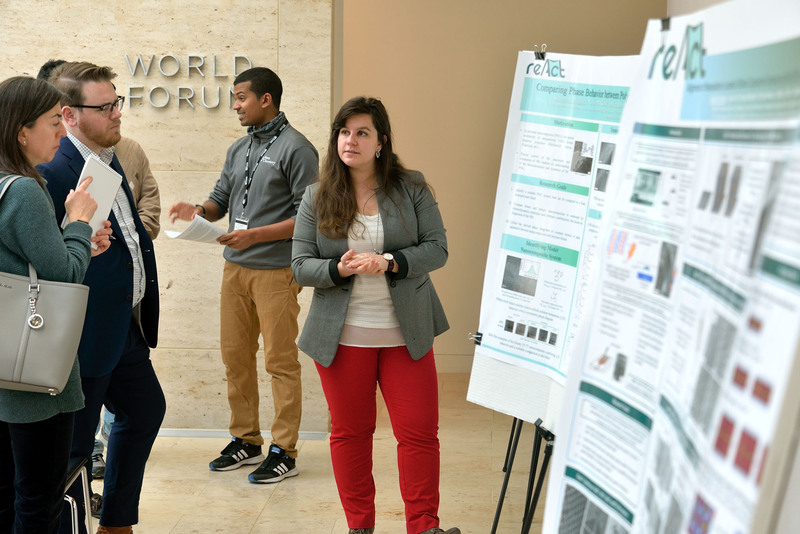 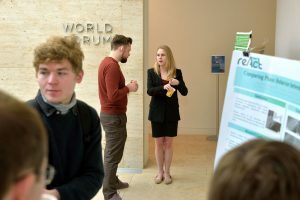 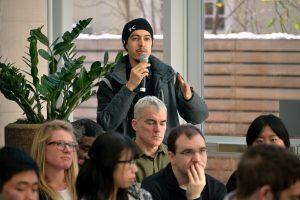 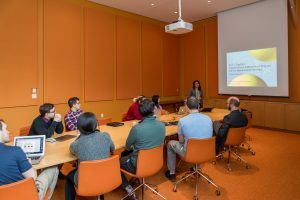 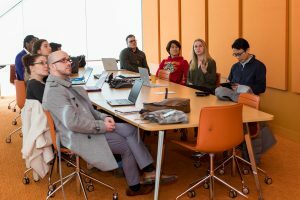 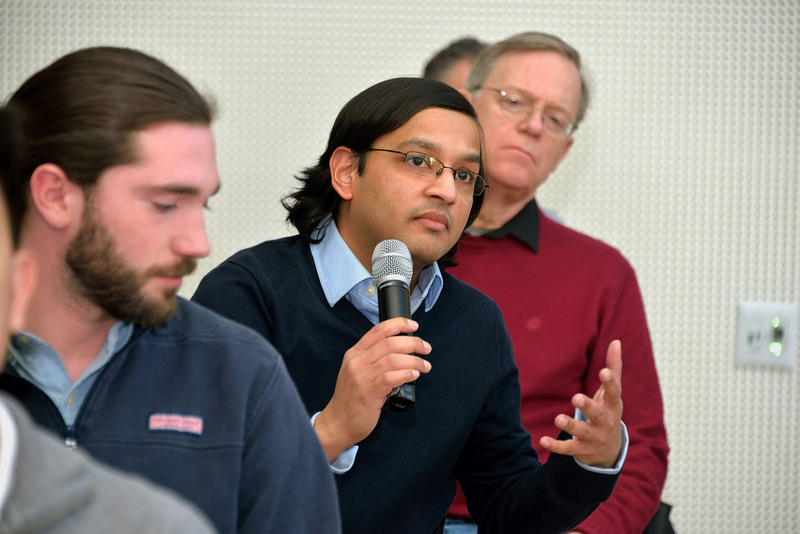 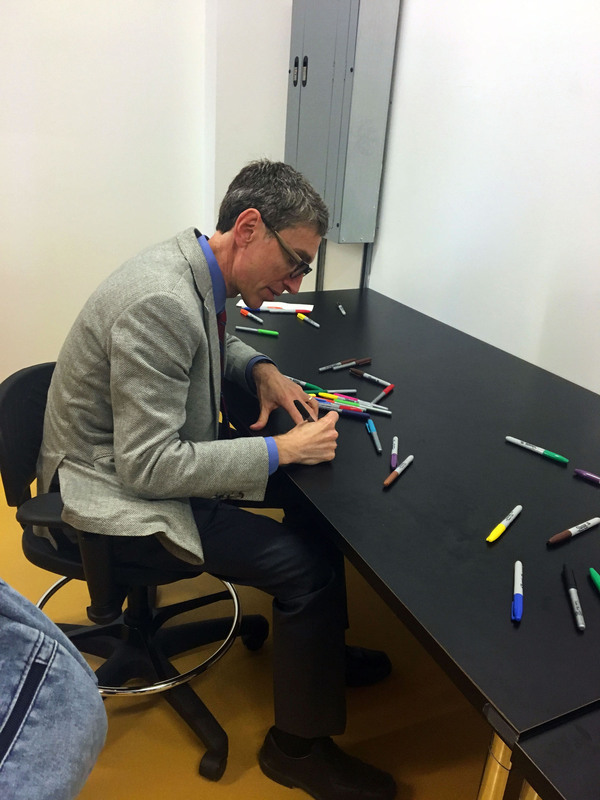 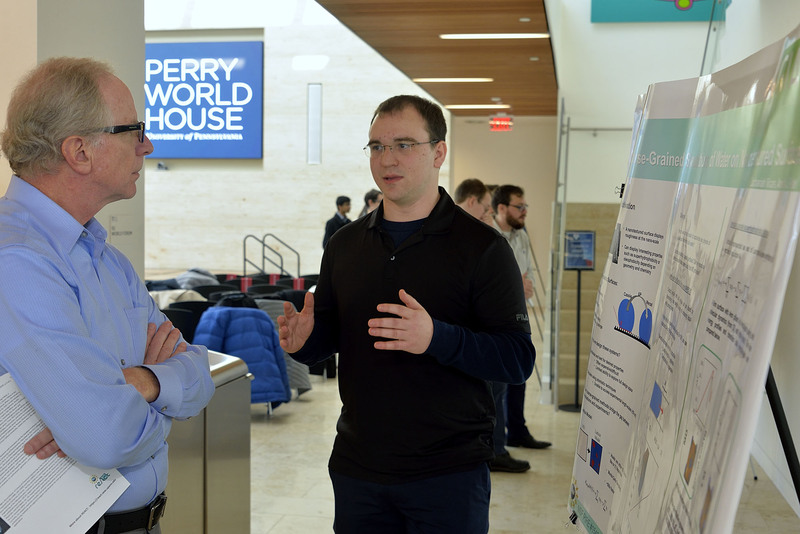 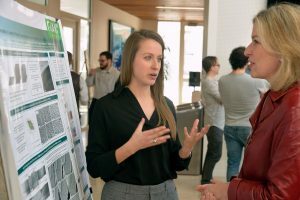 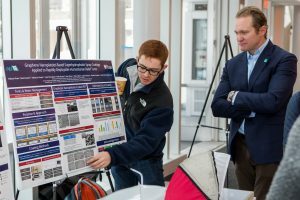 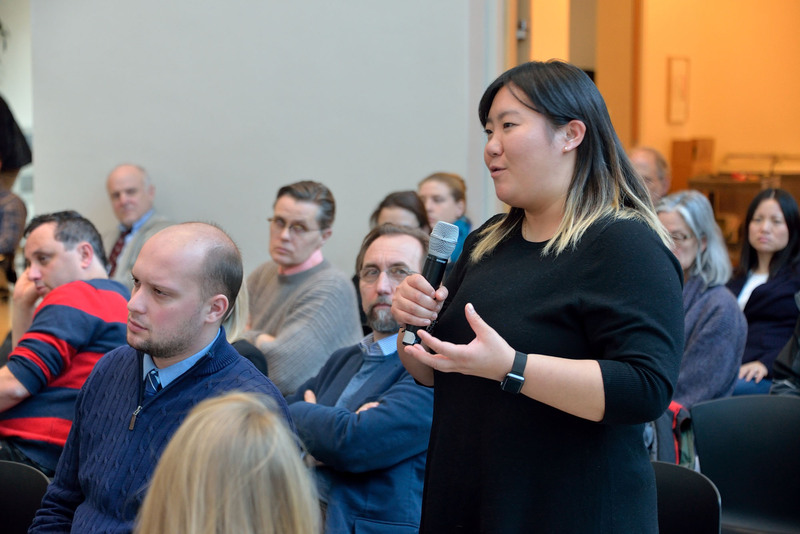 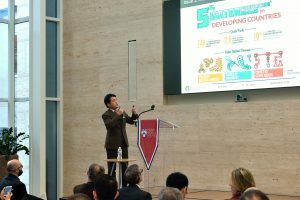 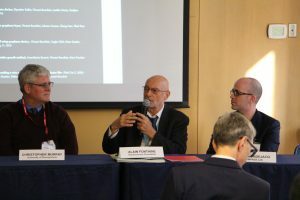 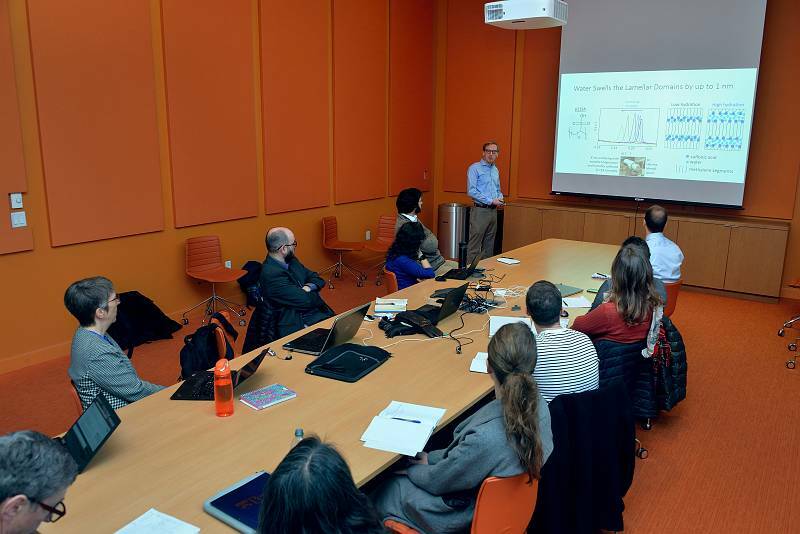 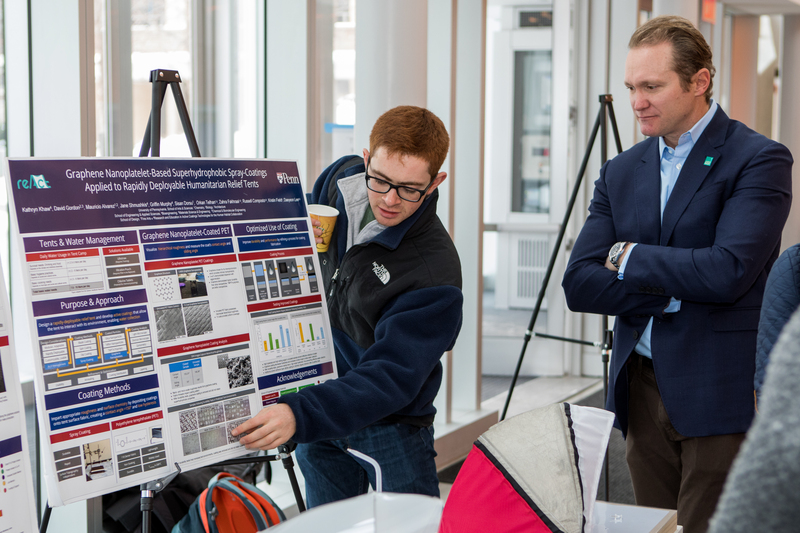 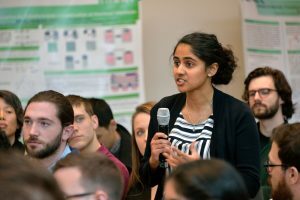 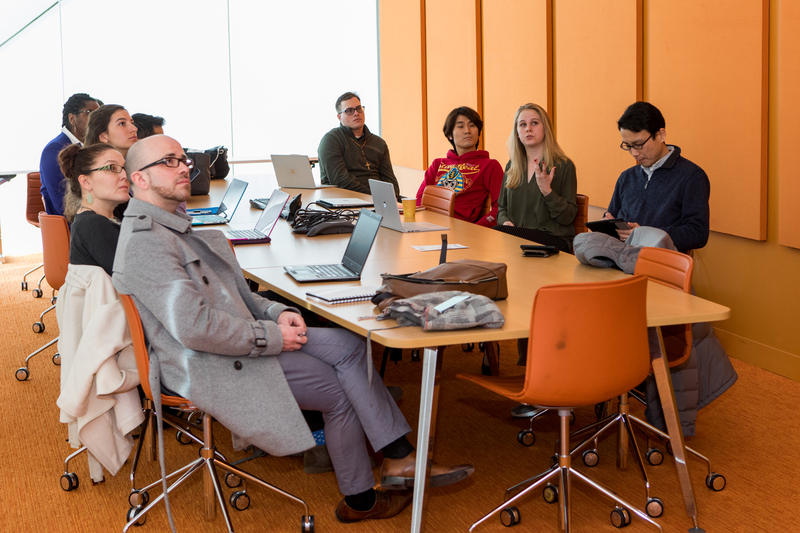 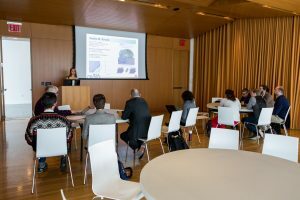 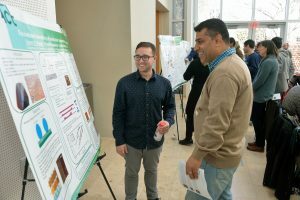 Scenes from the research meetings and the poster session on January 14, 2019. 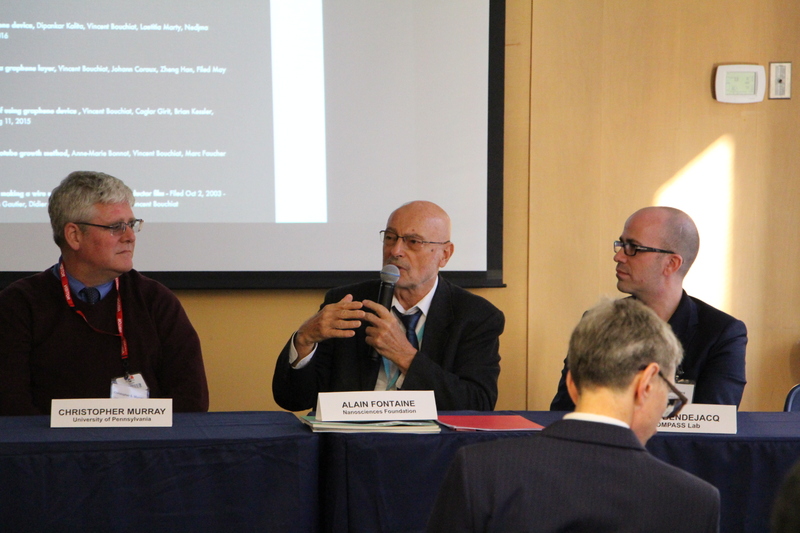 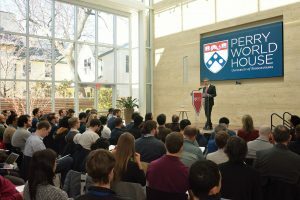 The program for and videos of the symposium talks are here. 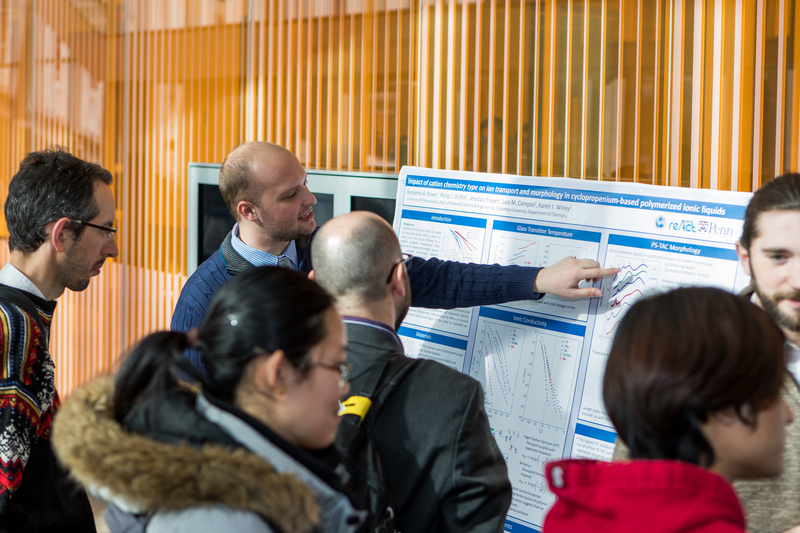 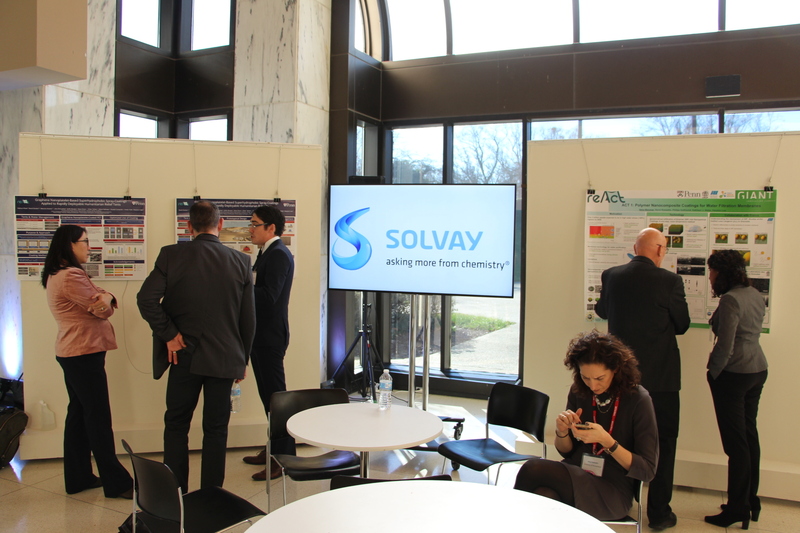 Scenes from the research meetings and the poster session on January 8, 2018. 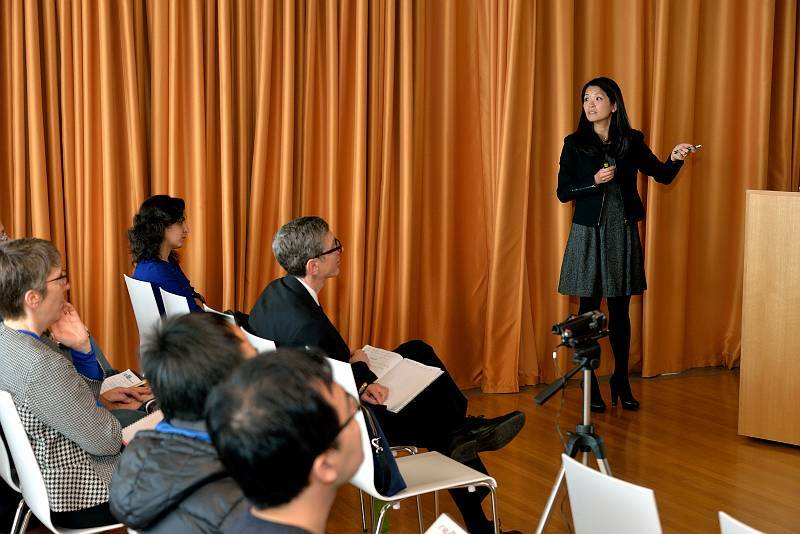 The program for and videos of the symposium talks are here. 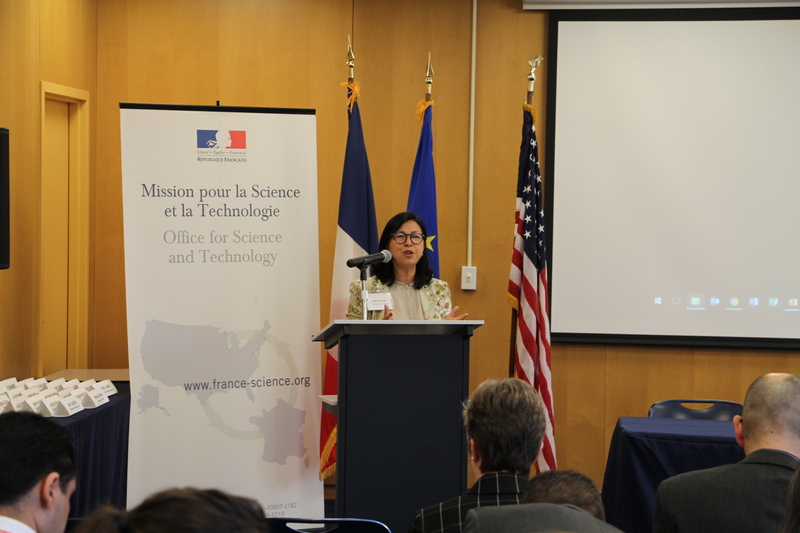 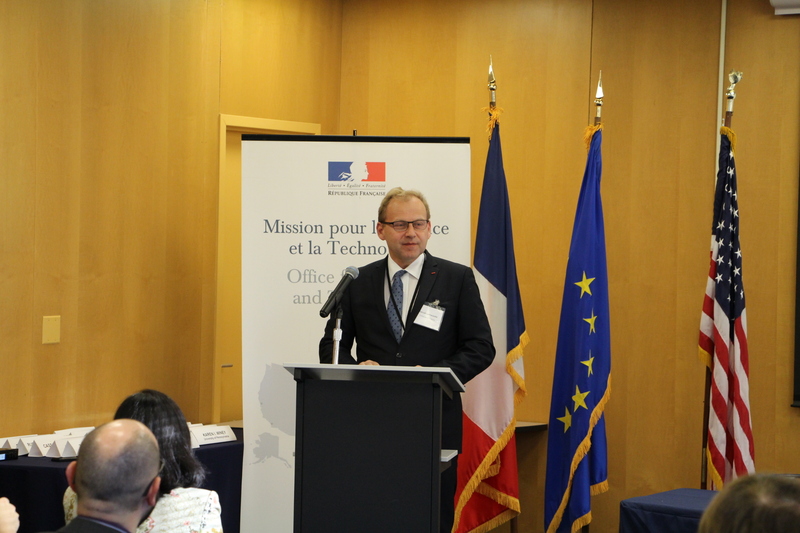 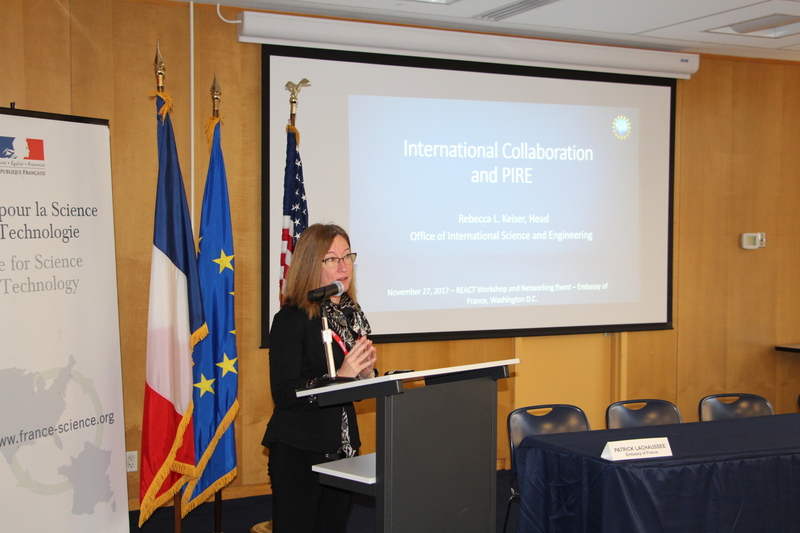 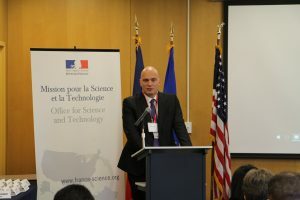 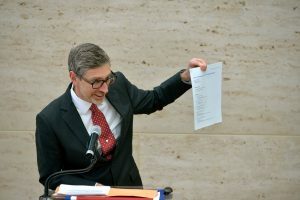 Monday, November 27, 2017 at the Embassy of France in the United States. 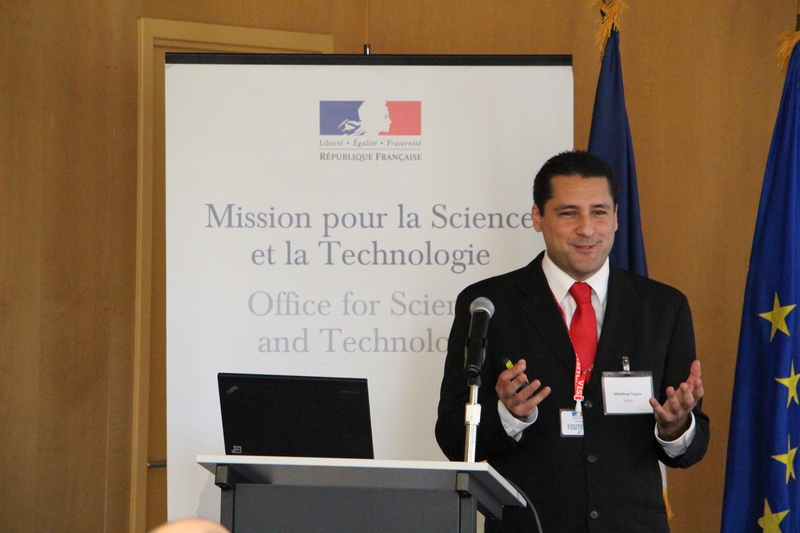 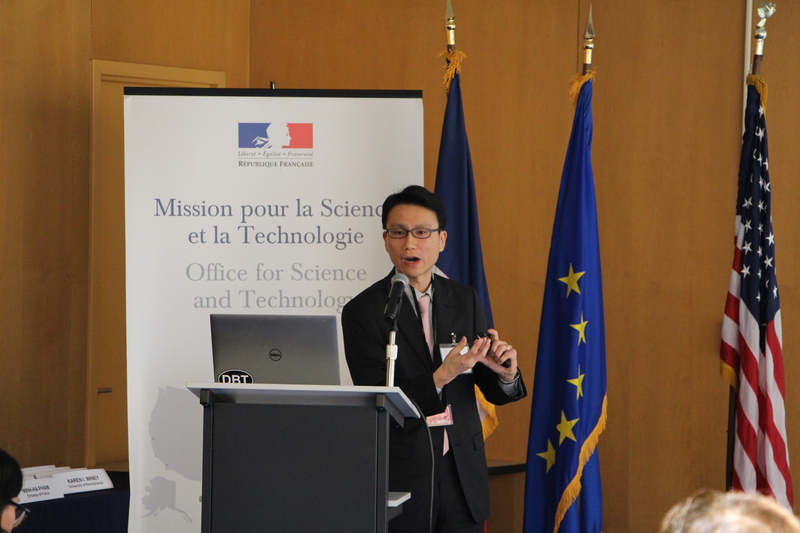 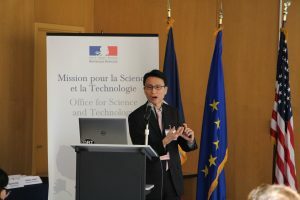 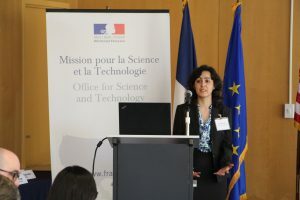 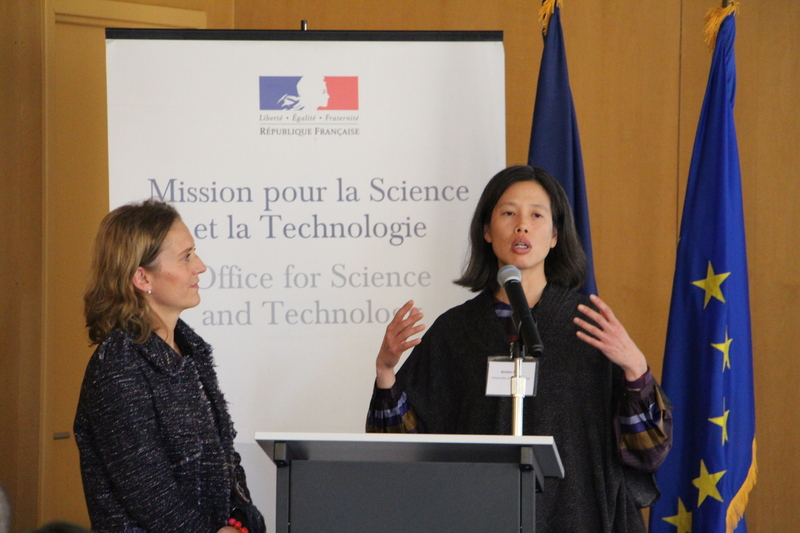 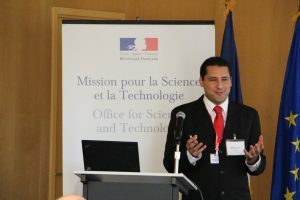 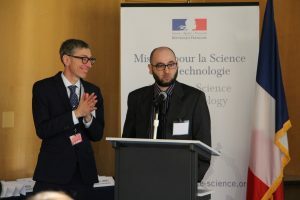 Photos courtesy of the Office for Science and Technology. 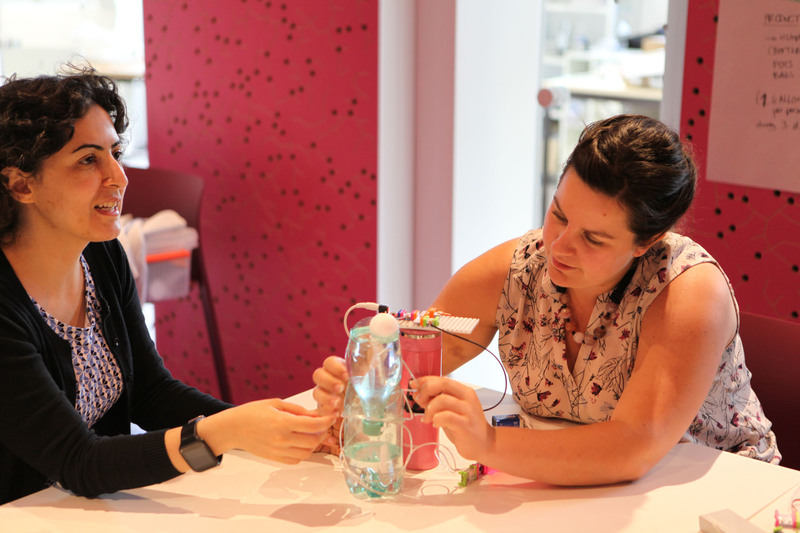 The 2017 REACT cohort at GIANT was challenged with a three day workshop of hands-on tent prototyping. 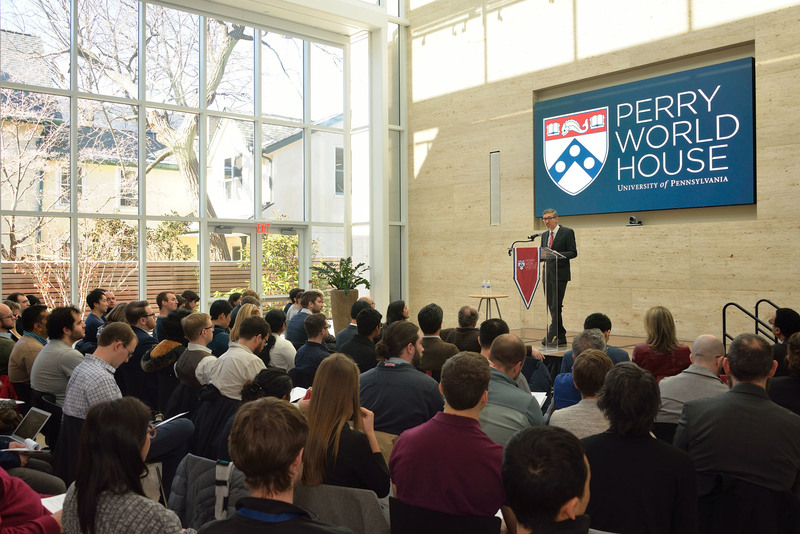 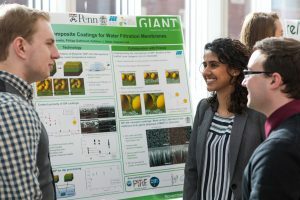 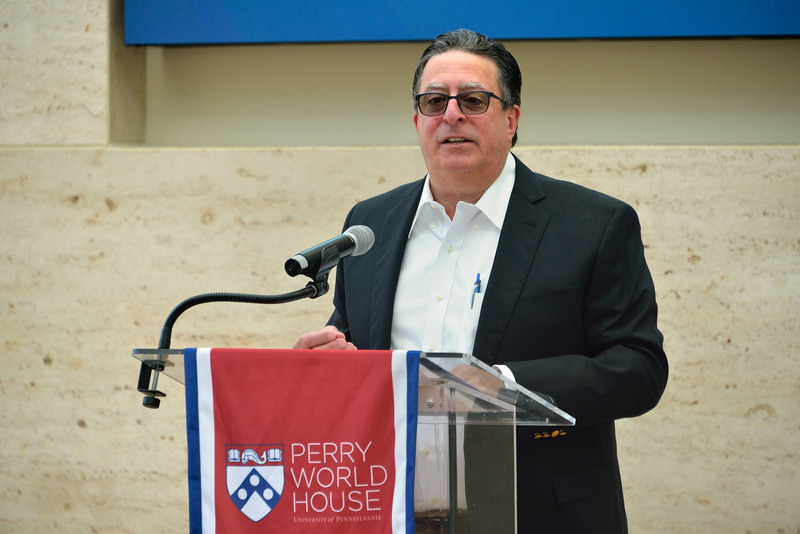 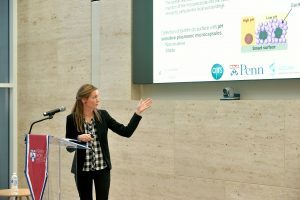 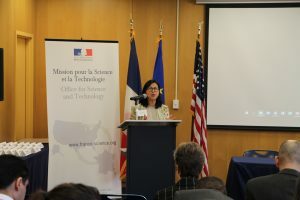 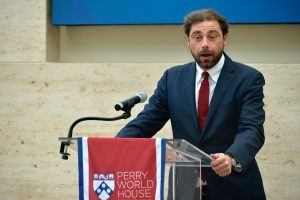 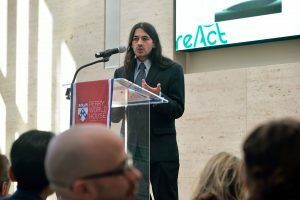 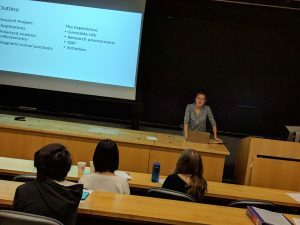 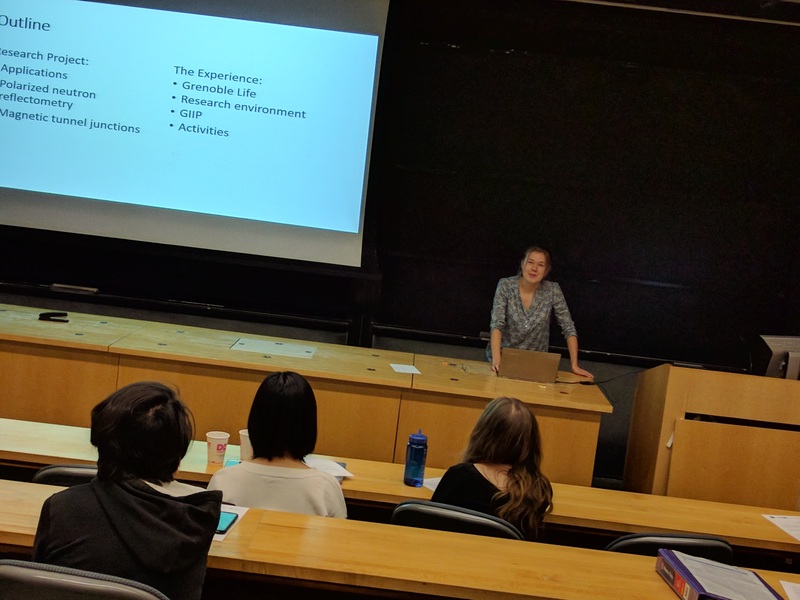 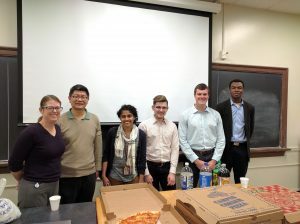 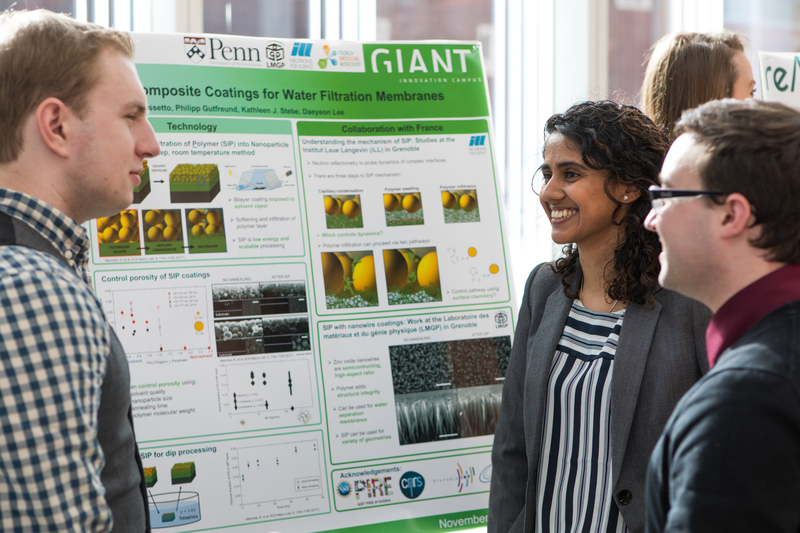 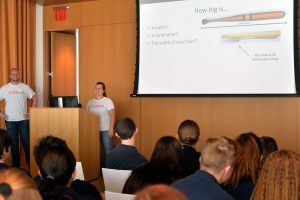 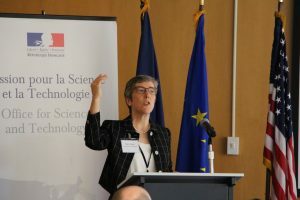 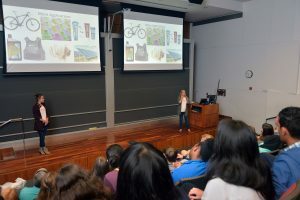 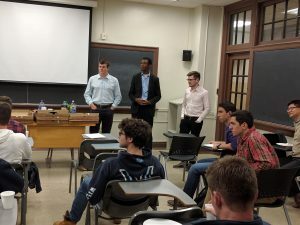 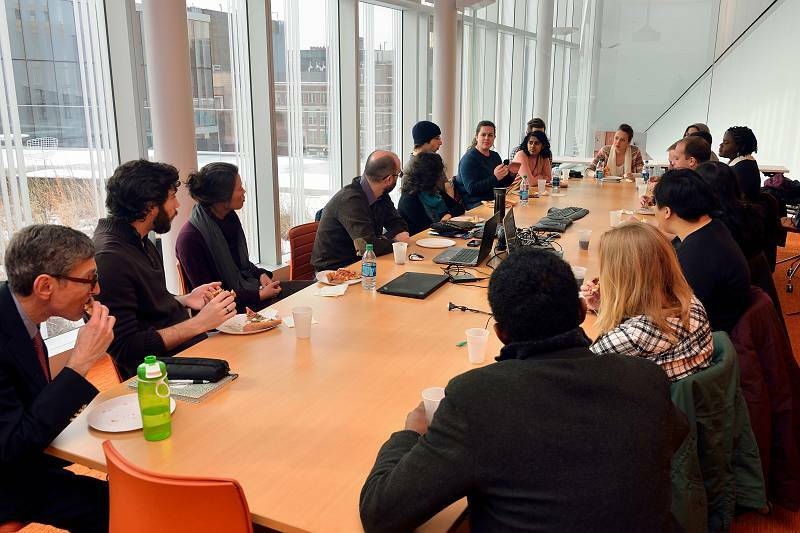 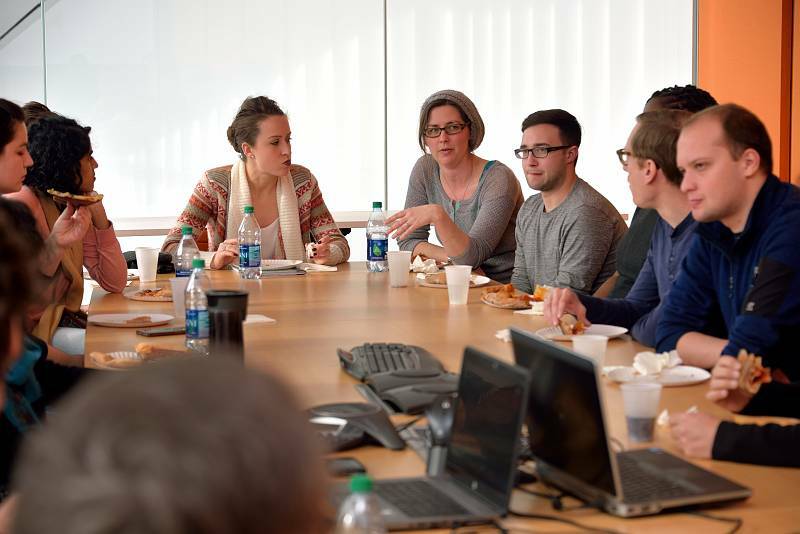 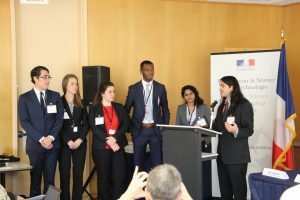 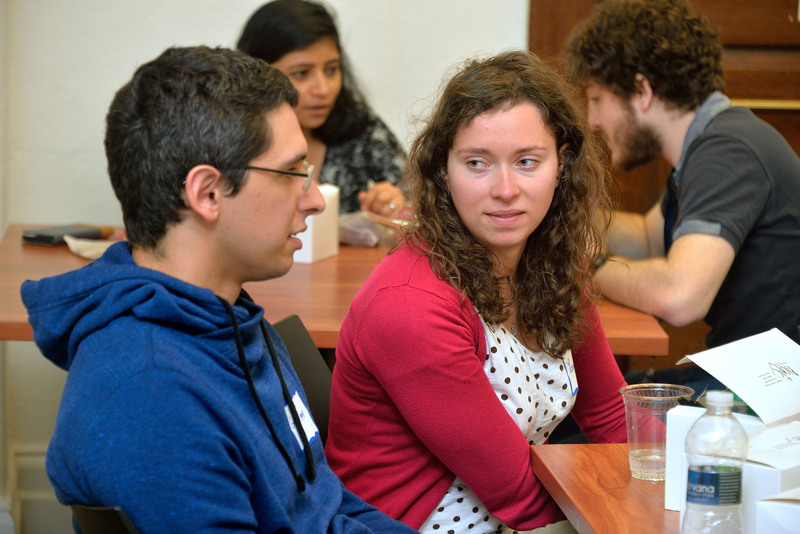 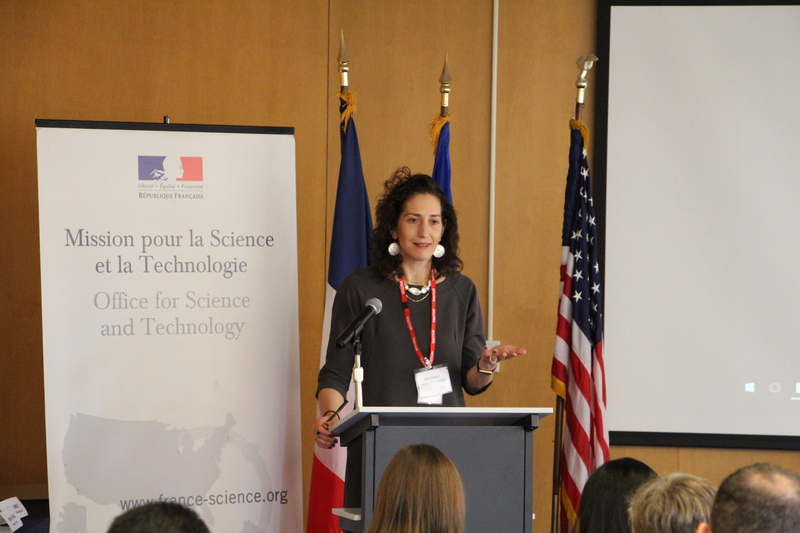 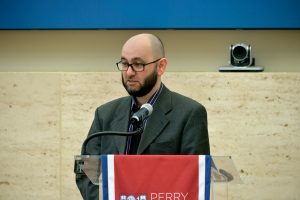 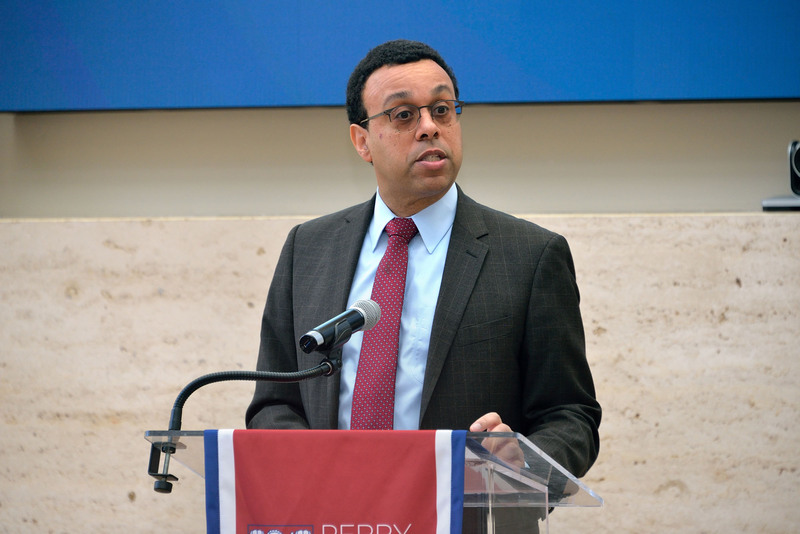 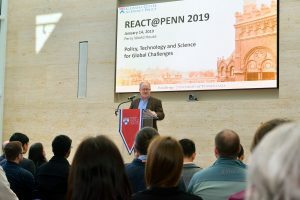 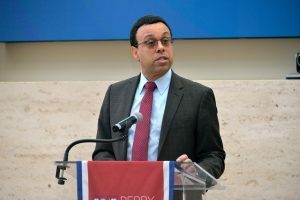 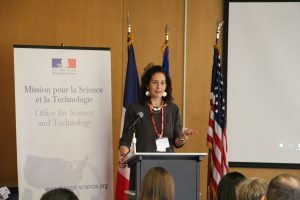 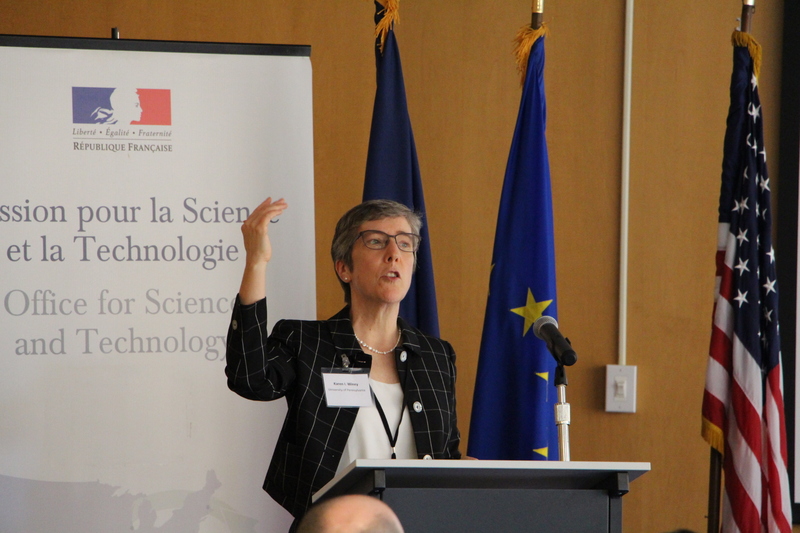 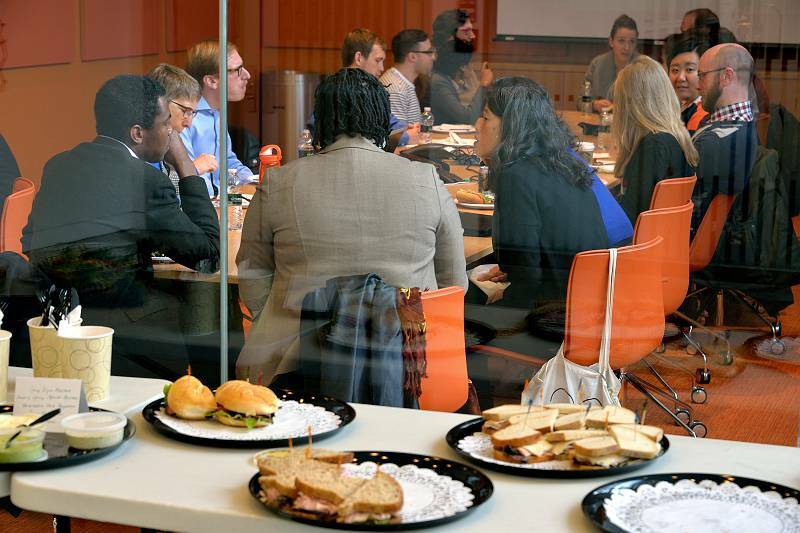 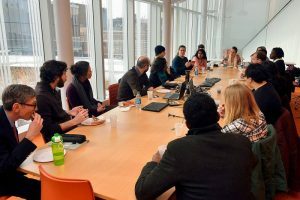 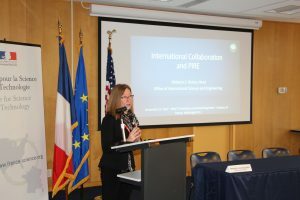 On May 30, visiting French students from Grenoble, in the REACT program, and American undergraduates in the Singh Center REU program met their research mentors at a lunch on their first day at the University of Pennsylvania. 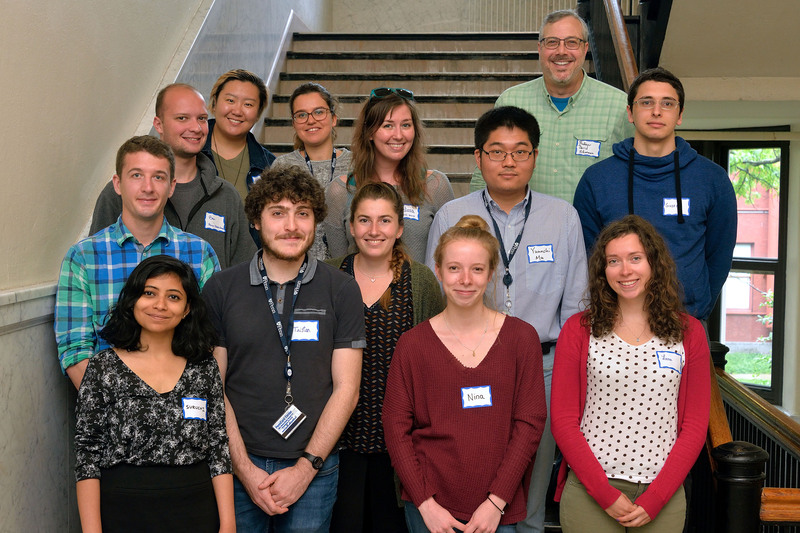 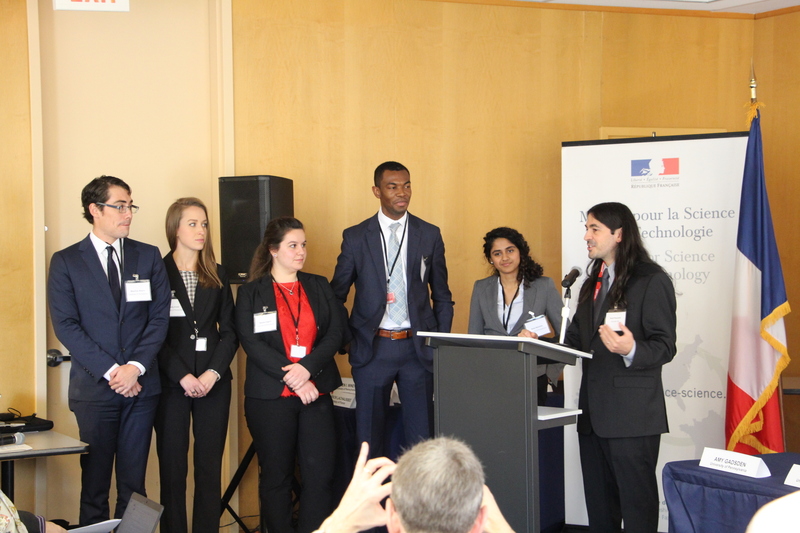 Grenoble students with some of their Penn mentors, which include graduate students, postdocs and faculty. 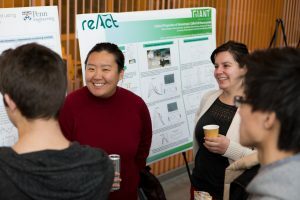 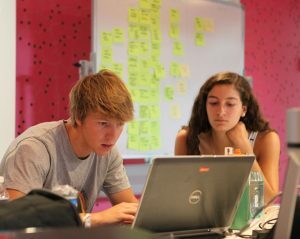 REACT Fellows Emily Lin, Ben Paren, and Melissa Vettleson are part of the pictured mentoring team. 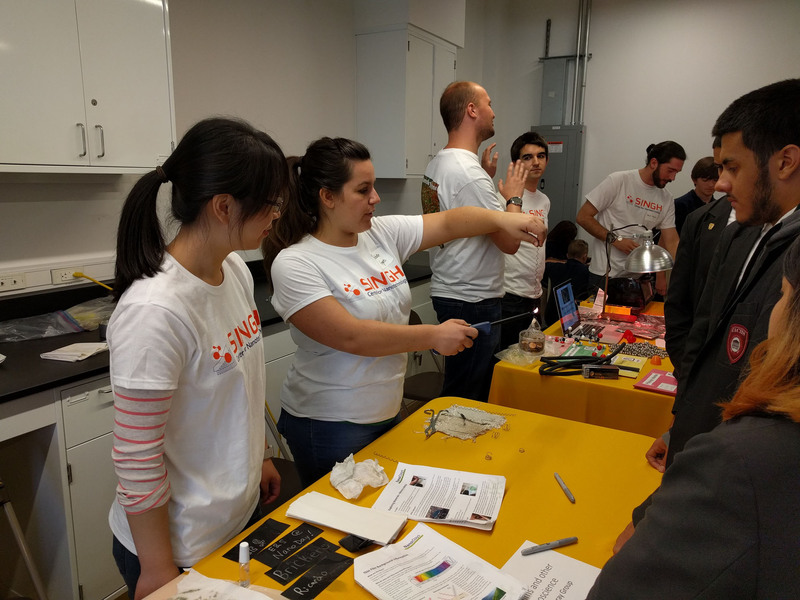 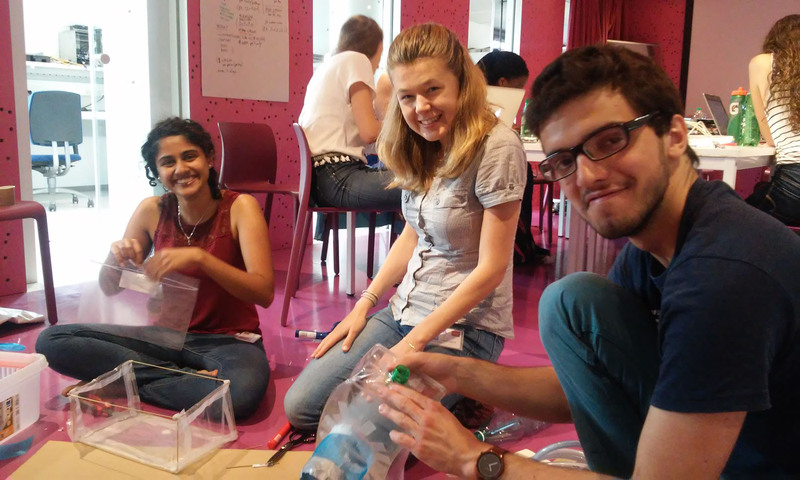 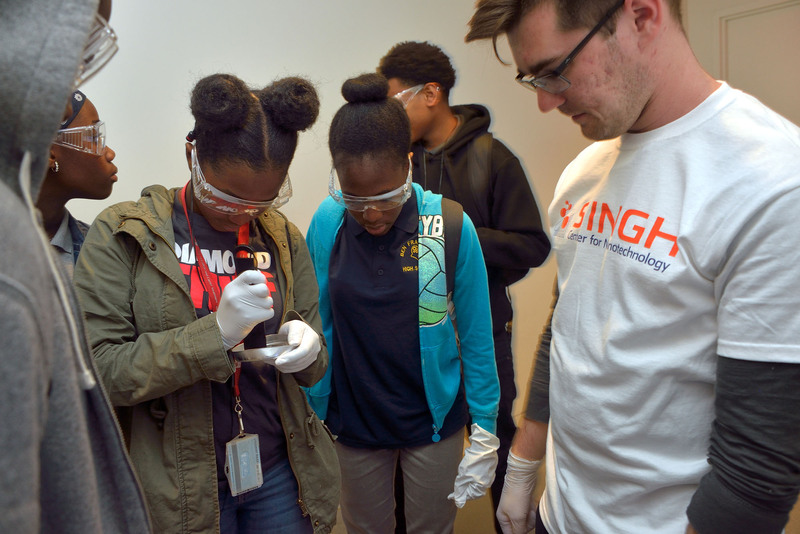 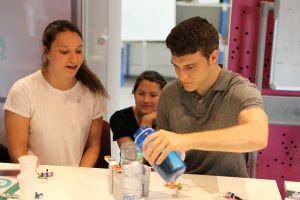 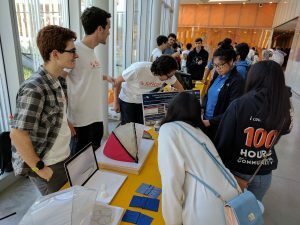 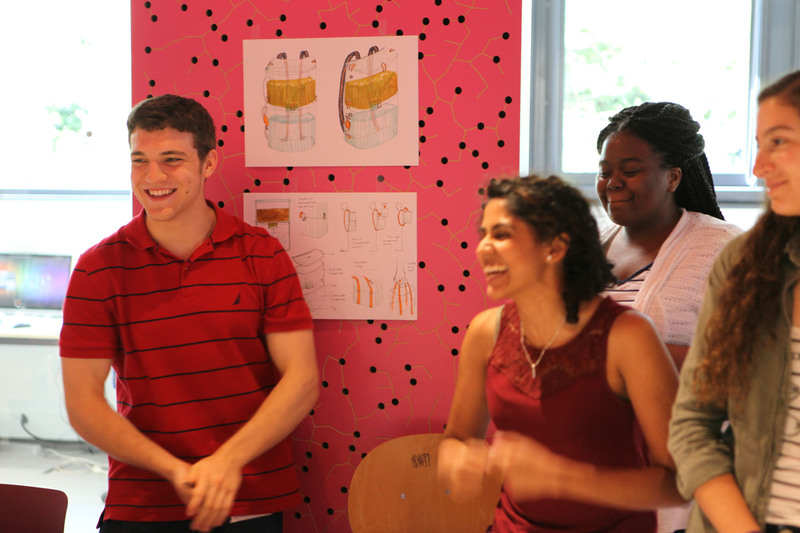 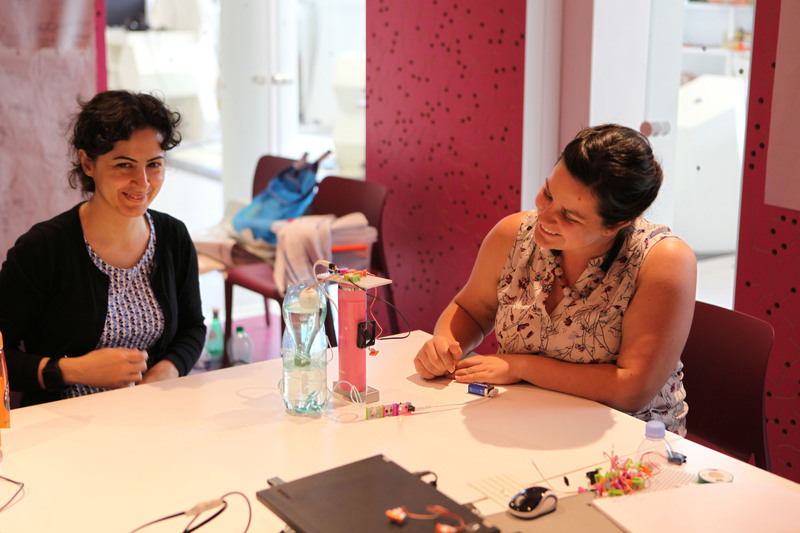 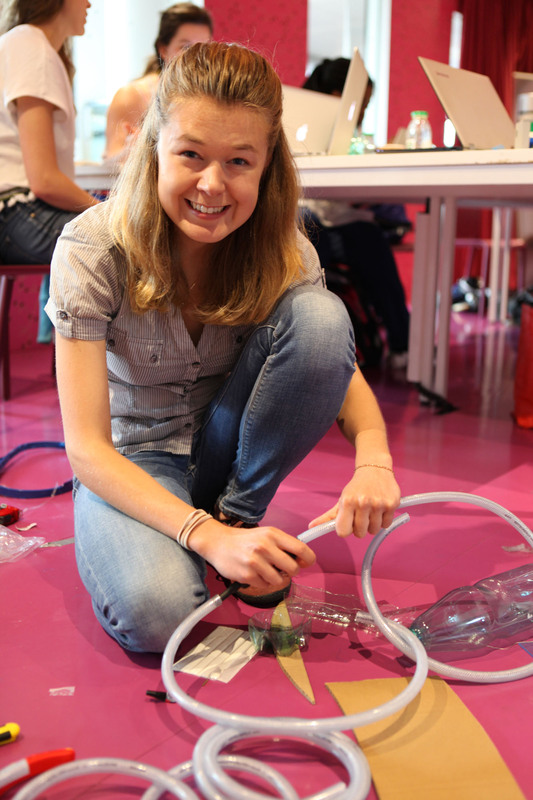 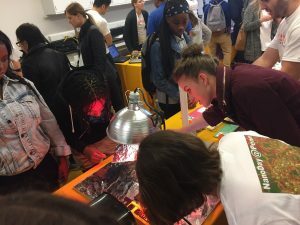 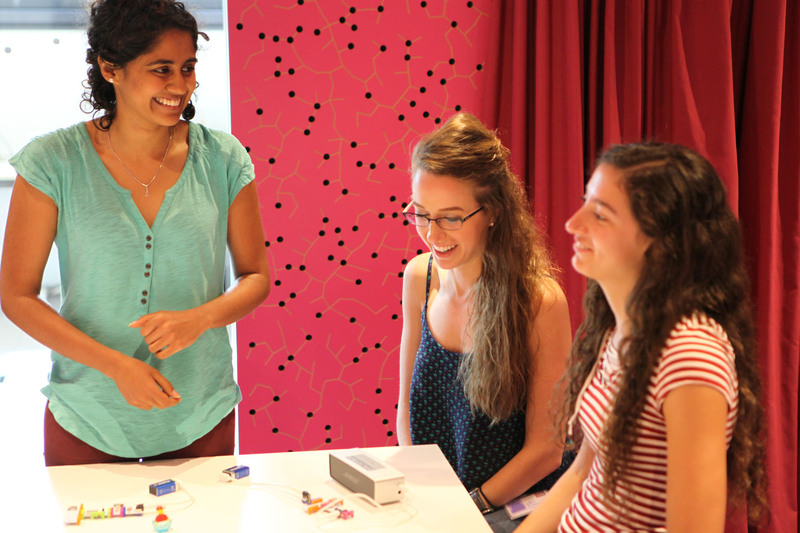 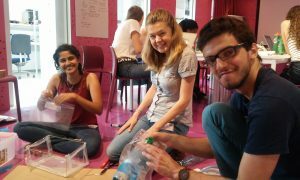 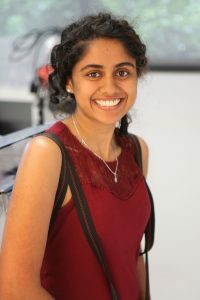 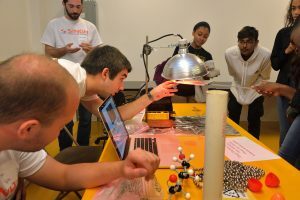 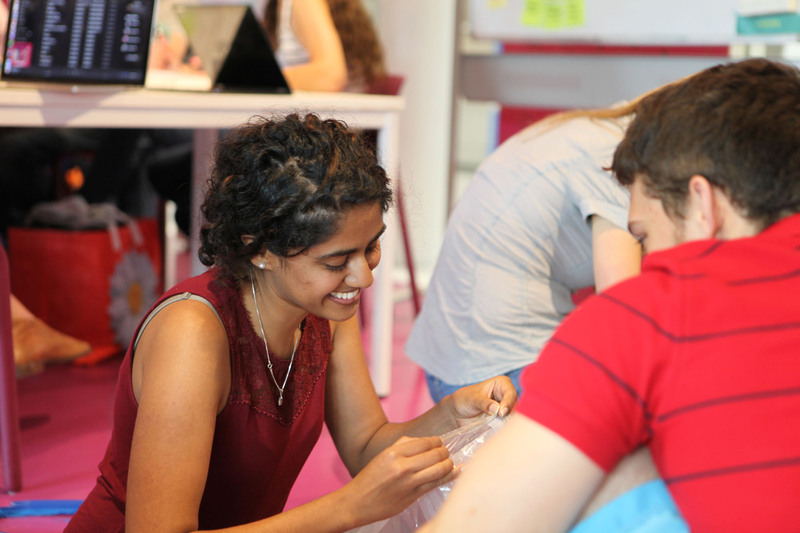 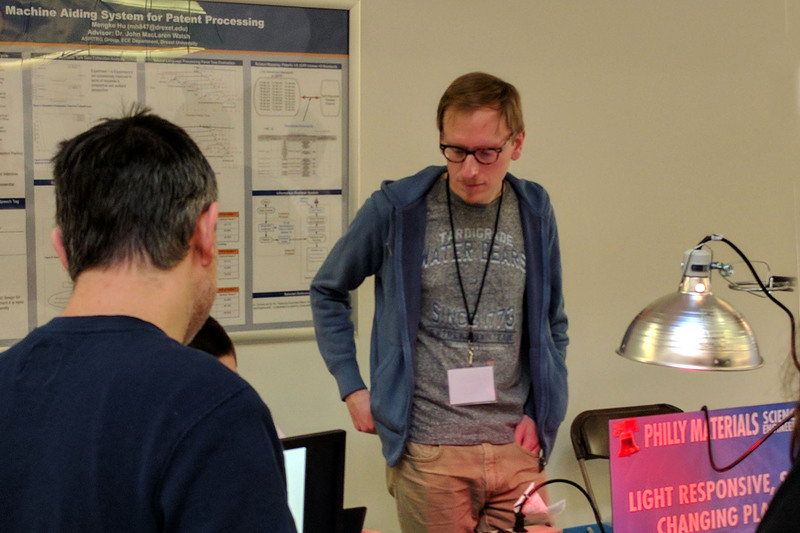 REACT Fellows participate in various outreach events through the year. 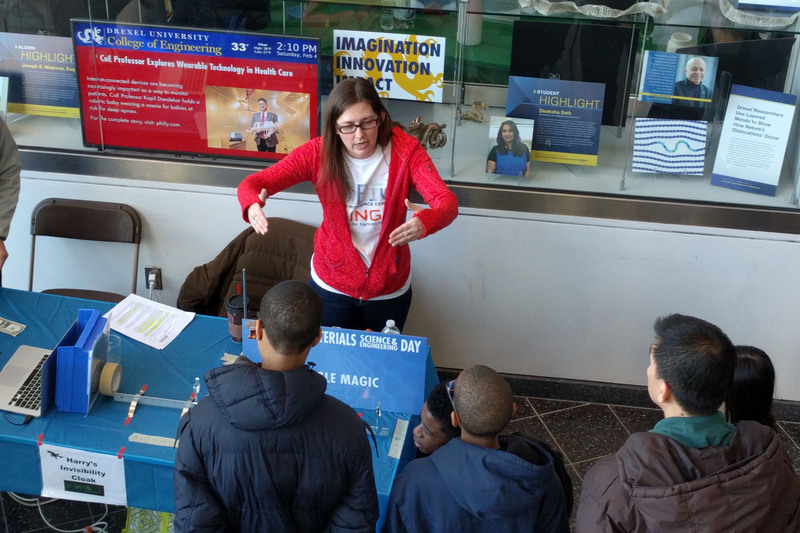 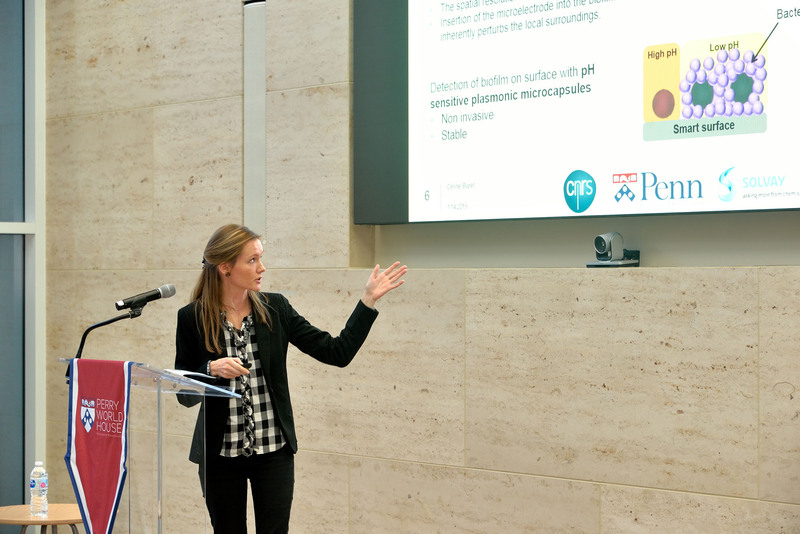 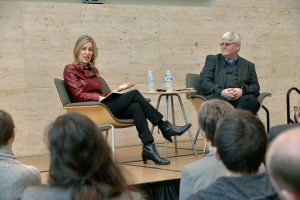 Melissa Vettleson and Ted Trigg shared their expertise and passion for science at Philadelphia Materials Day on February 4, 2017. 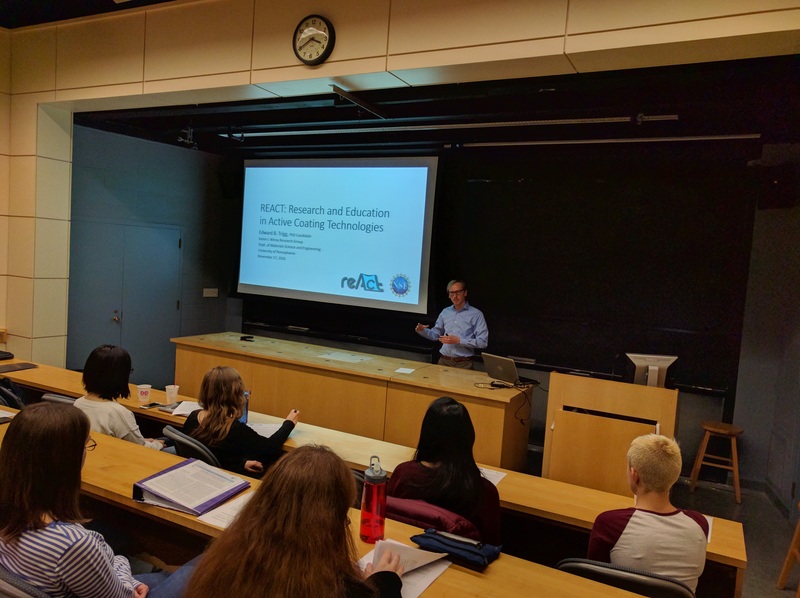 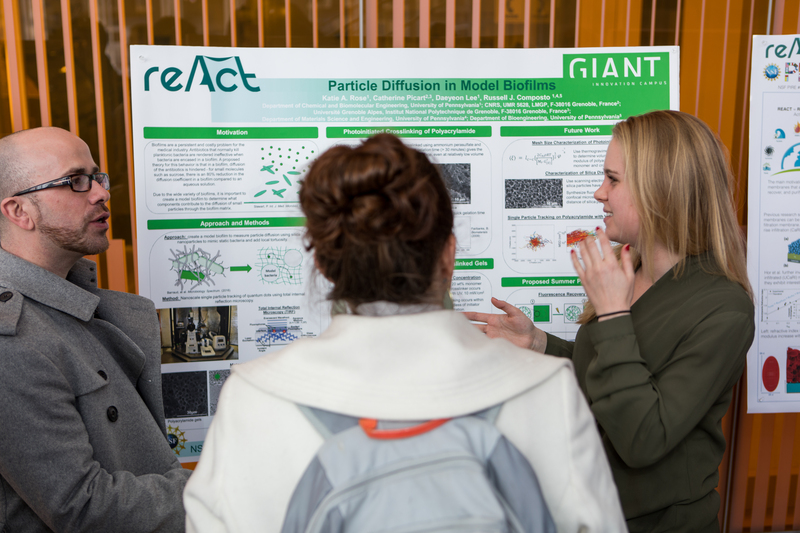 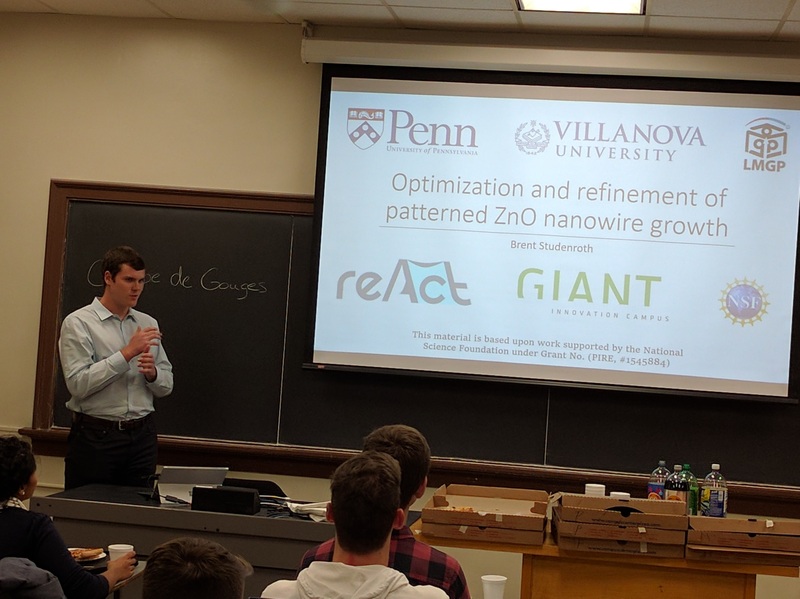 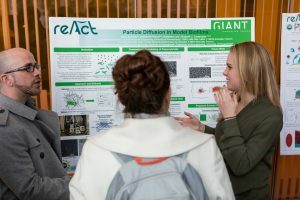 REACT Fellows and BMC and Villanova students presented sessions to encourage undergraduates to apply for REACT’s summer research opportunity at GIANT. 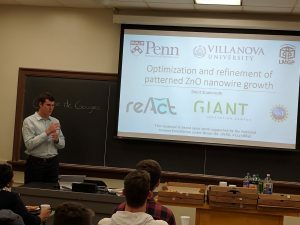 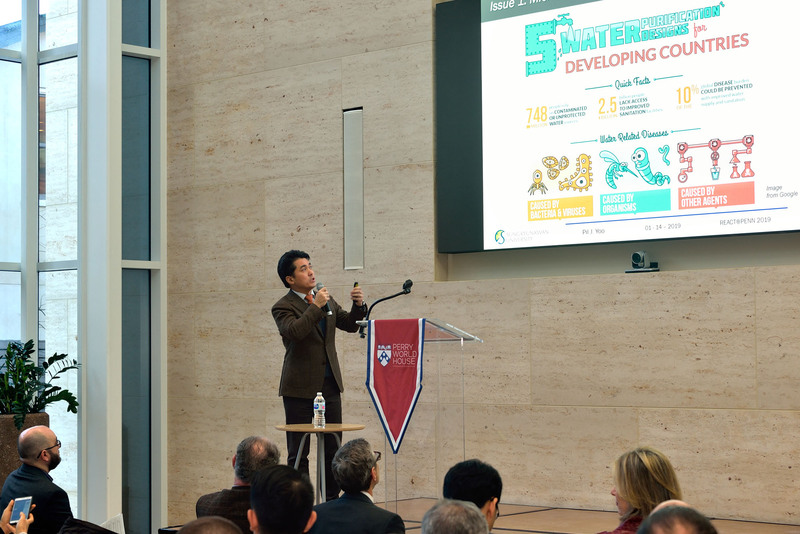 The BMC session was on November 18, 2016 and the Villanova session was on December 1, 2016. 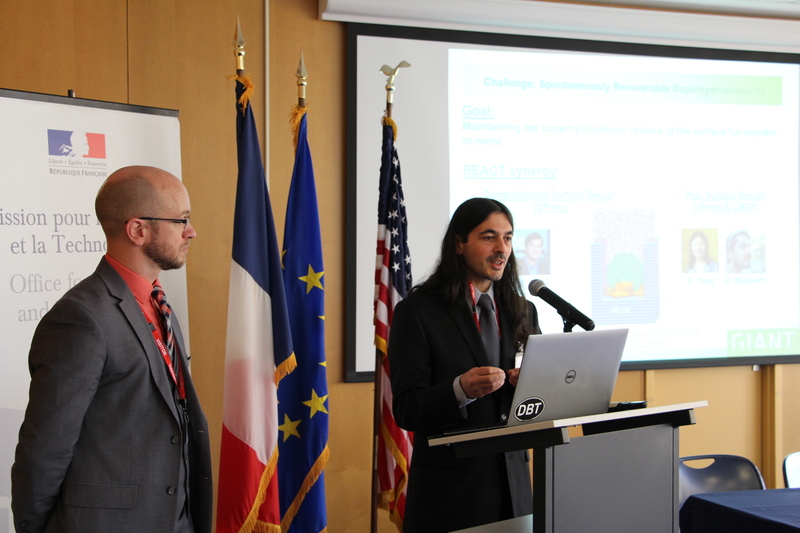 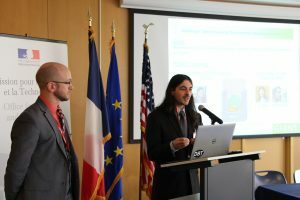 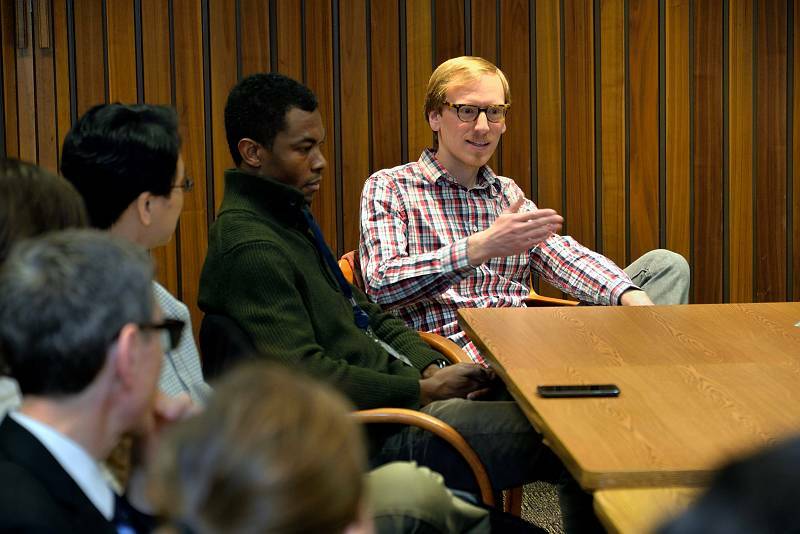 Brent Studenroth and REACT Fellows Tagbo Niepa and David Ring field questions about working in France. 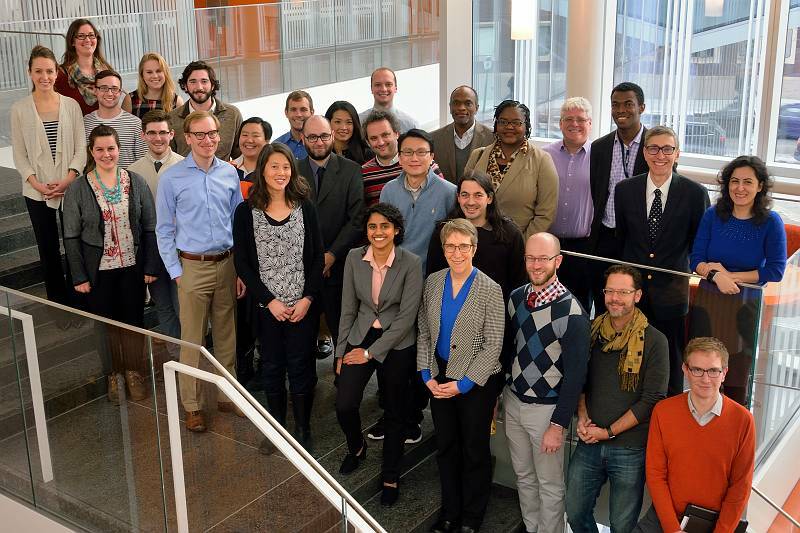 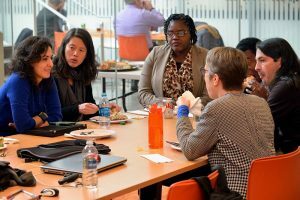 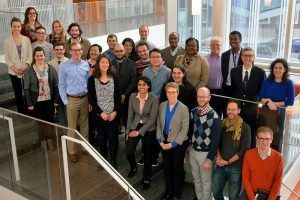 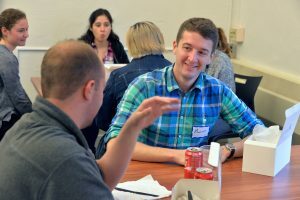 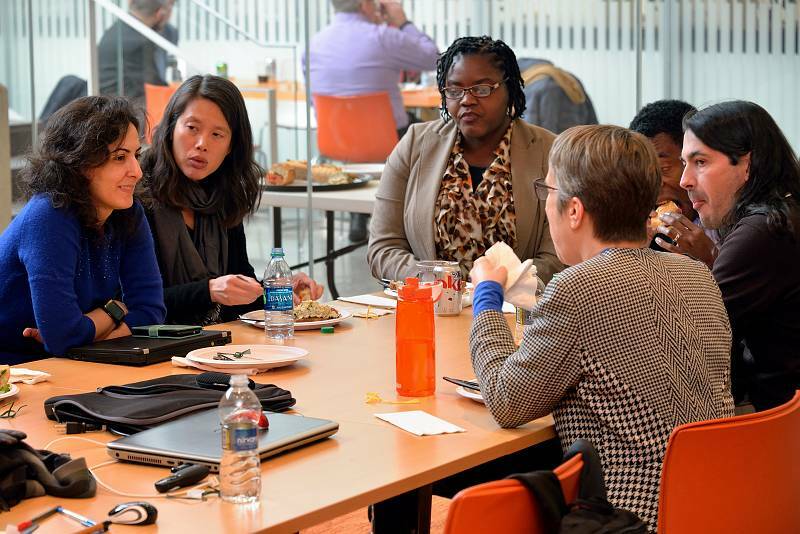 The 2016 and 2017 cohorts of REACT Fellows were invited to meet each other and the REACT PIs over lunch on November 21, 2016. 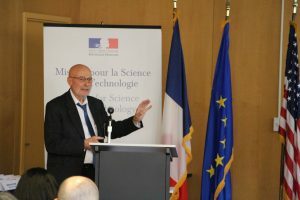 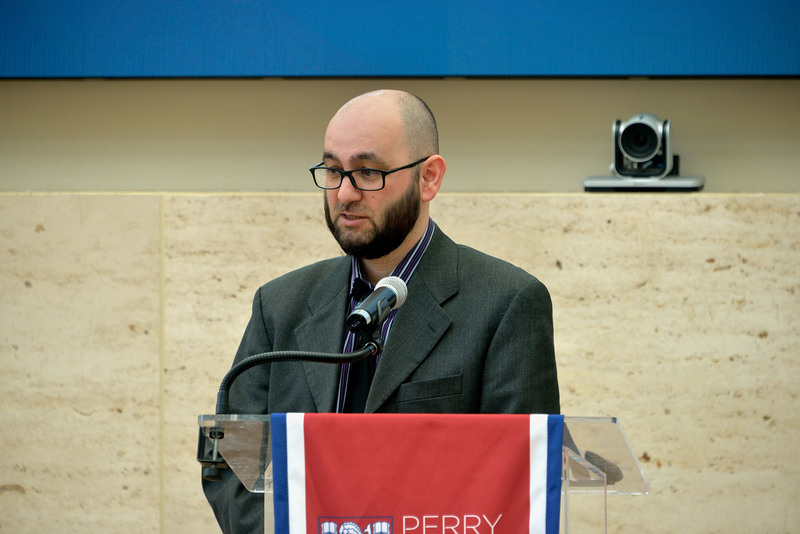 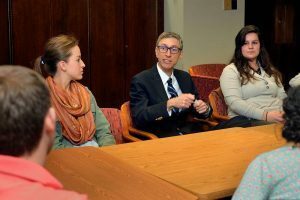 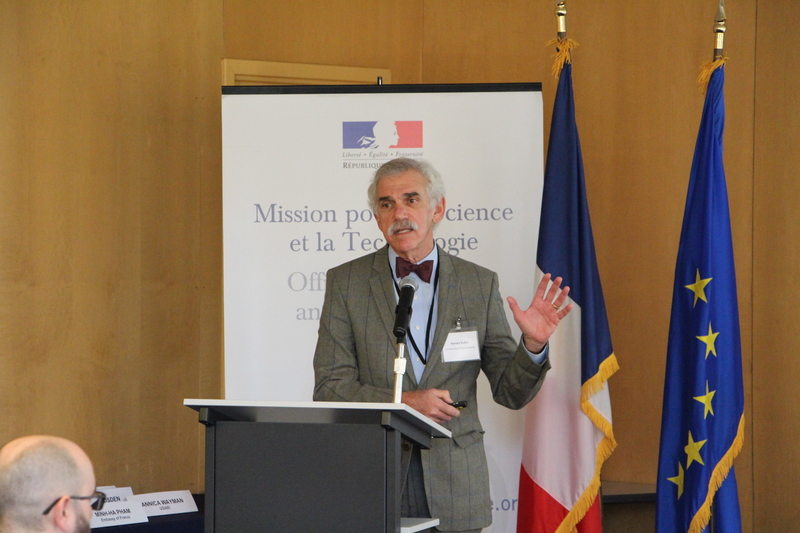 Edward (Ted) Trigg shares thoughts about preparing for research in France with the new Fellows. 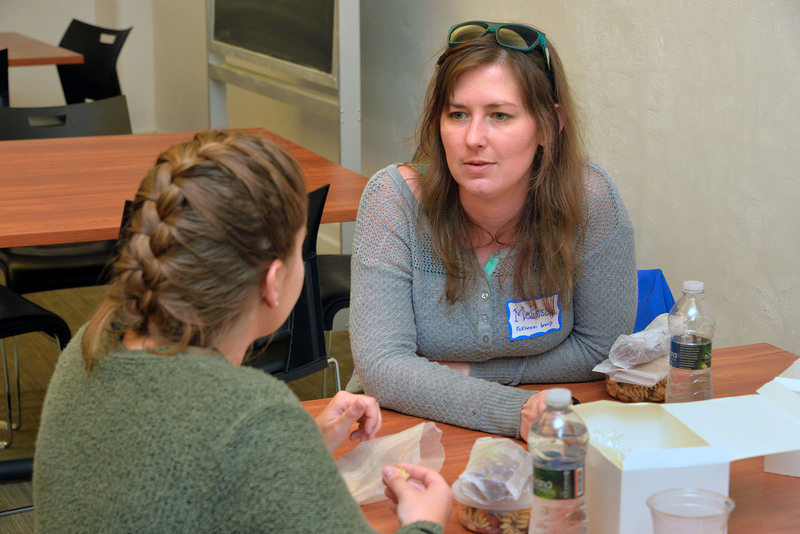 Kristin Field explains expectations for participating in professional development workshops.